For the likes of Robben Ford, Larry Carlton, Michael Landau, Sonny Landreth, Eric Johnson, Joe Bonamassa, John Mayer, SRV and Lowell George, this would have been just another day. All either current or past owners of the fabled Dumble, they used the near-mythical amps to sculpt their sounds and playing to a level of artistry forever embedded in six-string history. For me, not so much. A confirmed enthusiast player at best, the sound of my heroes has nevertheless fuelled a passion for inspirational sounds. I’ve been lucky enough to play pretty much all the classics along the way so far, but quality time with a genuine Overdrive Special by Dumble has eluded me… until now. A couple of hours with one, uninterrupted in a studio, where we could crank it and really get acquainted? This might just be a once-in-a-lifetime deal. The amp in question was a custom order (they were all custom order) by a guy named Chuck Matses back in 1986. 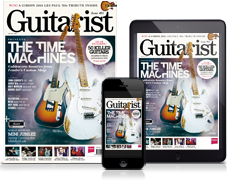 In a November 2015 article in Vintage Guitar magazine, Matses explains how he was a big fan of Jackson Browne, Rick Vito and David Lindley. Needing that Dumble tone in his life, he enquired directly to Mr Dumble. A conversation ensued, he paid the money, and five months later this arrived. Mr Matses recently sold it via Denmark Street Guitars in London, the new owner being gracious enough to let it pass through our hands en route. Serial number 0128, it’s right in there as an ultra-desirable blackface ODS, in absolutely stunning original condition. There’s a pile of correspondence between Matses and Dumble intact, though, out of respect, we are asked for those exchanges to remain private. I start on the most familiar ground possible: my blue Strat. Flick the standby switch, normal input, master at zero and gently up with the volume. We’re greeted with a direct-sounding super-clean, super-dry presentation that leaves me absolutely nowhere to hide. I’ve written ‘revealing’ many times in amp reviews in the past, and this redefines my understanding of the term. But the sustain, oh the sustain, even from the sparkly, ultra-clean sound… and what’s this? Bloom? It’s almost like there’s a compressor - albeit the best compressor you’ve ever heard - that supports notes and chords with a spooky level of fullness and evenness that doesn’t die away like you’d expect from a Twin, Super or the like. I’m hitting it harder than I should to see where the give-point is. That power section and speaker are literally never going to give in to my single coils. It’s clean, clean, clean and I’m crying out for some reverb. Step on the preamp boost option and there’s more juice and edge, but it’s still eye-popping in the delivery, no smooth OD yet. Time for tweaking. There are no great surprises from the bright switch, although it quickly becomes clear that there are near endless options here, in conjunction with the FET input option - stronger, brighter, more presence - and the treble control. The ‘Deep’ switch is a mid/bottom-end shift that seems to suit big, clean, single-coil chords in one position, or more articulation and cut with single-note leads in the other. Rock/Jazz? Makes very little sense to me as you might expect. I prefer the immediacy, attack - everything in fact - about the Rock setting. It’s staying there. Next up is a very tasty Gene Baker RF model. Chambered and very well poised, the sharpness of the single coils is gone, underpinned with more mid richness. Ushering in the overdrive section, all that really hits me are more questions. How can a sound be thick with gain, yet so clear at the same time? How can there be so much note articulation and yet seemingly endless sustain? How has my playing become so untidy in the space of 24 hours? Why am I finding this so hard to play? I thought it would be like butter. Time for an ear break, some deep breaths and a cup of coffee. We chat, we discuss, we’re all dumble-founded (sorry, couldn’t resist) by the sound level and sheer spread coming from a ‘mere’ 1x12 combo. It’s almost anathema to imagine needing this kind of volume these days with many stage levels being so low, but a quick flick through Dumble’s most famous user-list confirms that they all like/liked to play loud. Contextually, that’s really important - remember that during the time these amps were being developed, PA, monitoring and in-ears were nothing like they are today. Volume - being heard and being able to clearly hear yourself - was every bit as important as ‘tone’ to many guitar players. Back in the room, I head back to more familiar territory and pull out a Cherry ES-335 borrowed from my good friend, Peter Honoré. For good measure, we’ve also connected up the separate Dumbleator valve-powered effects loop, into which is plumbed an Analog Man ARDX20 delay. Ah, some much-needed ambience. The 335 is more compressed than the Baker, less strident and easier under the fingers, perhaps due to the familiarity. Not before time, I’m now starting to approach the guitar more softly and letting the amp do the work. I don’t have to ask it to respond in the same way I do with my usual amps, and I really wish that penny had dropped earlier. For the first time I’m getting a real sense of that ‘classic’ Dumble sound that had embedded itself in my head. Of course it’s just one example of how it can sound, not how it always does. We stop, we start, we talk. My playing improves slightly, but I think the red light fever and giant expectations have taken their toll. A couple of hours later, I’ve given it as much as I can. I wish we had two months and a string of gigs. The car journey home is full of discussion. The incredulousness at the crazy prices; the intrigue, myth and legend that surrounds these amps and their seldom-seen creator. It’s all mad. Isn’t it? The whole experience sinks in over the following few days, after which time it seems okay to draw a few conclusions. Most important, this is ‘just’ one Dumble, so any observations are about this amp and this amp only. That said, a lot of what I’ve come to understand about their general appeal (after interviewing many of their key players over the years) does finally make some personal sense. It helps me understand why I like what I like about many of those players - their touch, feel, articulation, precision, individuality - and how an amp such as this would help them achieve that level of expression in a way a ‘normal’ amp may not. Sure, they will always sound like ‘them’ no matter what they plug into. But for that ultimate, final one per cent of ‘them’? Just maybe. Back to Earth, clearly no amp is a solution or an instant route to a sound. It’s merely an enabler for your voice, and having played this I think I get it as much as I’ll ever get it. Please forgive the personal indulgence (and the first-person singular narrative), but there was no other way to tell this story. Dumble Overdrive Special 0128 is unlike any other amplifier I’ve ever played. 12. AC Outlet: To plug in another amp, reverb unit/effects loop (Dumbleator), etc.